I made it! I accomplished the most difficult pastry I've ever attempted to bake: croissants and pains au chocolat. The result was delicious! 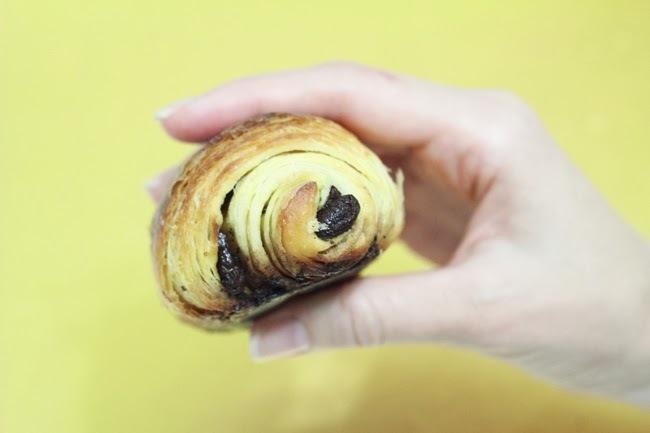 After making the lemon tart, one of my all-time favorite desserts, I decided I wanted to attempt one of my favorite viennoiseries, one of my top choices for breakfast: pains au chocolat, which is just like a chocolate croissant, except with a roll shape. 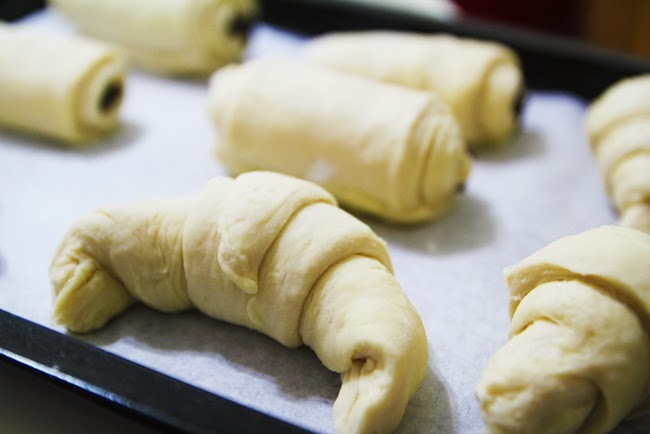 The dough for the pains au chocolat and the croissants is prepared in the exact same way, so I finally decided to bake some croissants as well, just because their shape is cuter :) I used this video recipe from Baking with Julia (prominent Julia Child that is). For these kind of really elaborated recipes, I think a video recipe is the way to go, because it leaves no room for doubts as sometimes happens with written recipes. It took me a total of almost 2 days from the very first step to the very last, so you'll understand after so much effort how bad I wanted these pastries to come out great!!! Well, they did. Once again, I'm proud of myself! Thanks to my lovely husband who helped me shape the croissants and pains au chocolat. 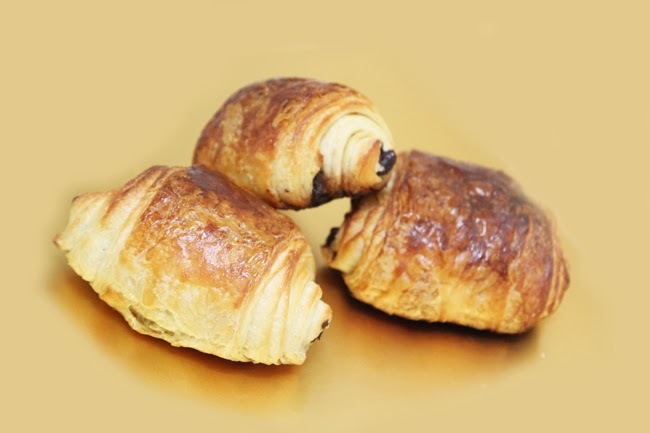 And special thanks as well to Maison Eric Kayser, one of my favorite bakeries in town, who agreed to sell me some special chocolate bars for the pains au chocolat. The layered dough is a sign of work well done! This recipe yielded 8 pains au chocolat and 6 croissants, most of them slightly smaller than the ones you'd find in a bakery. I baked some of them and froze the rest, and now we can have fresh croissants every morning! :) Will you give it a try? 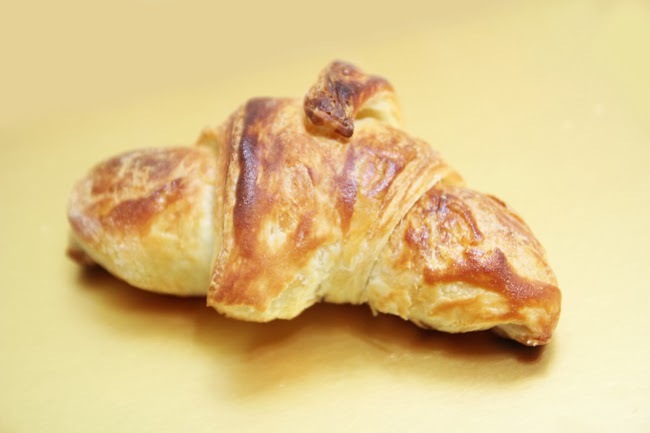 I've never made neither croissants or pan au choc, but I really really want to - it's the ultimate breakfast pastry and just the smell of it makes the mornings so much more special. Well done for mastering this baking challenge, you can definitely be proud of yourself!